We’re down to our last tomato from last year’s garden — and what a tomato! We picked it green about three months ago, and there it sits, intact, unblemished, finally red and ready to eat. It came from a paste tomato plant I bought last spring at Andrew’s Greenhouse in South Amherst. I don’t remember the variety, but it should have a name like Superkeeper. 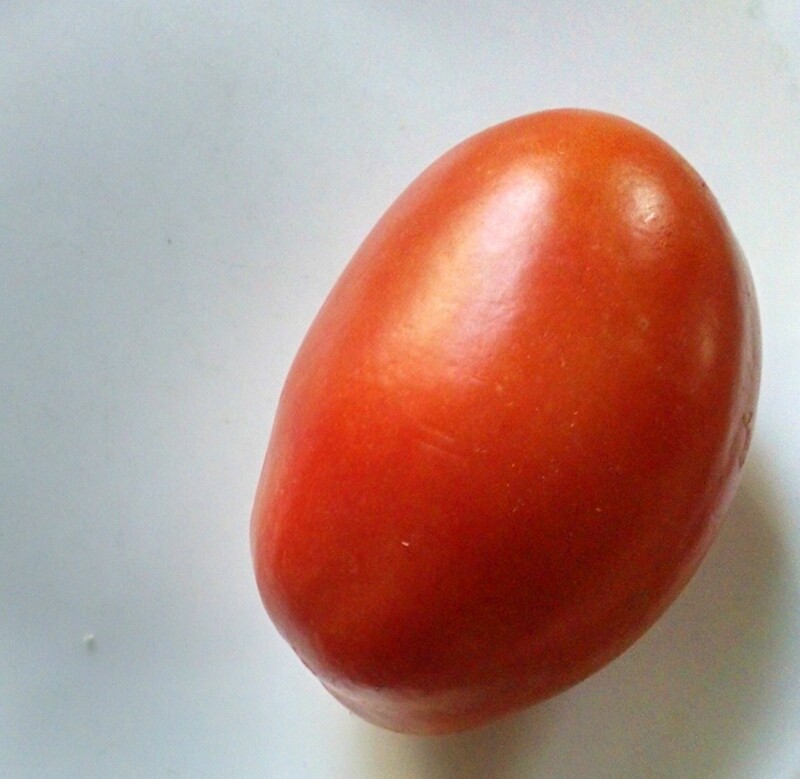 It’s unusual for a tomato to still be fresh and edible a month after it’s picked. Three months is unheard of. It was a great tomato year in 2015, with little of the Late Blight that bedeviled growers in previous years. We have 36 quarts of canned tomatoes in the basement, and about 10 quarts of tomato soup in the freezer. This is the coldest day of the winter so far, so it’s a good time to think about next year’s vegetable garden. 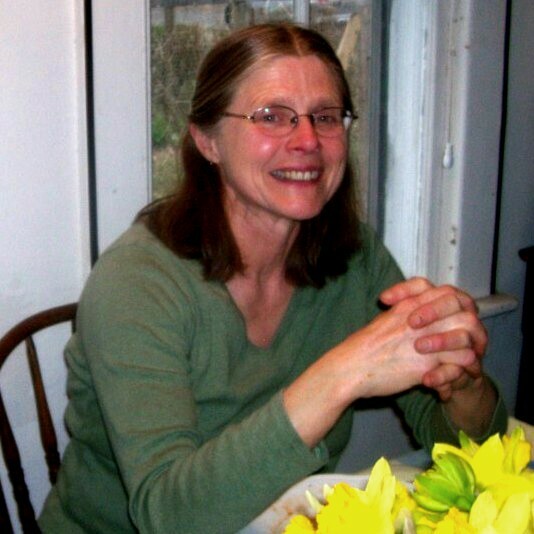 This will be the first year that I have sole responsibility for deciding what is planted and where, as Betsy shifts her focus to the perennial gardens. We have about 20 vegetable beds, averaging 25 square feet. Over the next few weeks, I’ll be reviewing what’s gone where in previous years, figuring out which beds can do double duty (such as spinach harvested in June to make way for peppers), and what plants can deter insects best (such as flowering radishes protecting zucchini plants). The main change is that I’ll buy more young plants from Andrew’s Greenhouse and start fewer from seed. Tomatoes, peppers, eggplant, broccoli and zucchini will all get Andrew’s professional care in their youth. This will cost more than starting seeds, but will reduce our worries about whether seedlings are getting the right amount of light or water. And I like supporting local businesses. We’ll still order seeds that go directly in the ground, such as peas, beans, carrots, spinach, beets, celery, rutabaga, cucumbers, butternut squash and lettuce. We have put peas, beans and cucumbers along three-quarters of the garden fence to give them a place to climb, and this year we’ll increase our dry bean crop by using the entire perimeter. For the first time, we’ll grow sweet potatoes that are offspring from last year’s. Betsy made cuttings from vines in the garden, rooted them, and they’re growing like house plants. And I’m going to try neighbor Jane Mildred’s technique of growing zucchini plants one to a hill and covering them in June to protect against vine-borer moths. Gardeners usually rotate their crops to minimize pests and disease, but I’ve read that tomatoes are an exception. 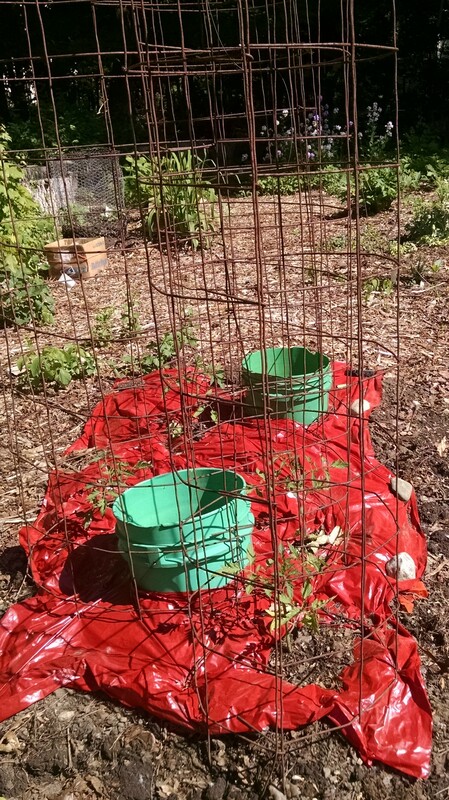 I got good results last year from placing tomato plants around a half-submerged bucket half-filled with compost, with holes drilled into the bottom, and red plastic mulch covering the bed. So I will do the same thing in the same bed and see if it works well again. Many questions remain, but for now the one I’m thinking about is: What should we do with that last tomato standing from the 2015 garden? For new readers of this blog, click here for a quick overview of 150 past posts in 13 categories, including simple living, frugality, gardening, cooking, living without and climate change. Or hover on Index above and click on a category. 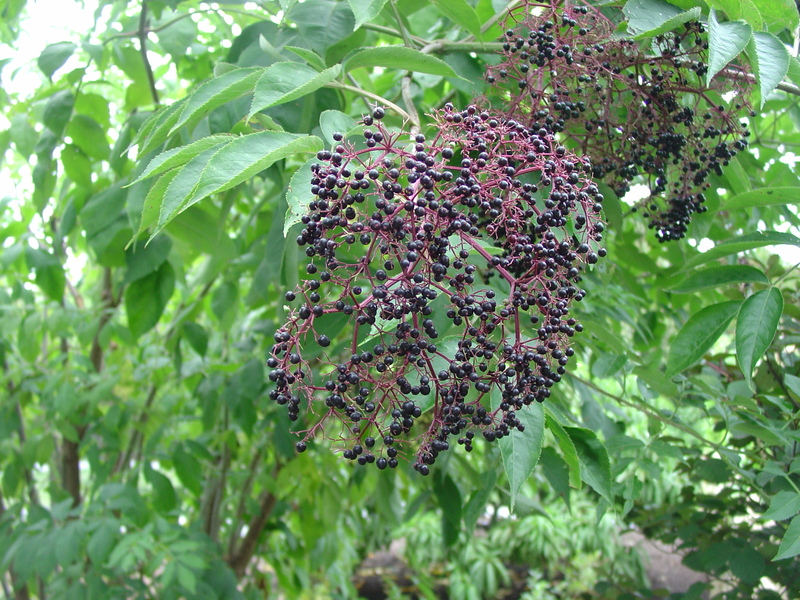 Black Elderberry, Sambucus nigra (of European origin), or the native North American Sambucus canadensis, yields abundant blossoms and berries that are high in antioxidants (like blueberries and cranberries). Today’s herbalists, like Hippocrates, also reach for elderberry for its immune-boosting, anti-inflammatory and anti-fever actions. In addition, this bush is easy to grow. It is happy in sunny locations, likes a range of soils of moderate fertility, and even has some flood tolerance, although it doesn’t like the soil to dry out when it is young. 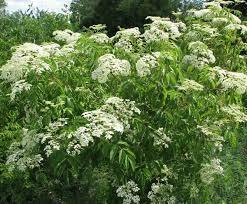 The spreading bush grows six to 12 feet tall and wide. 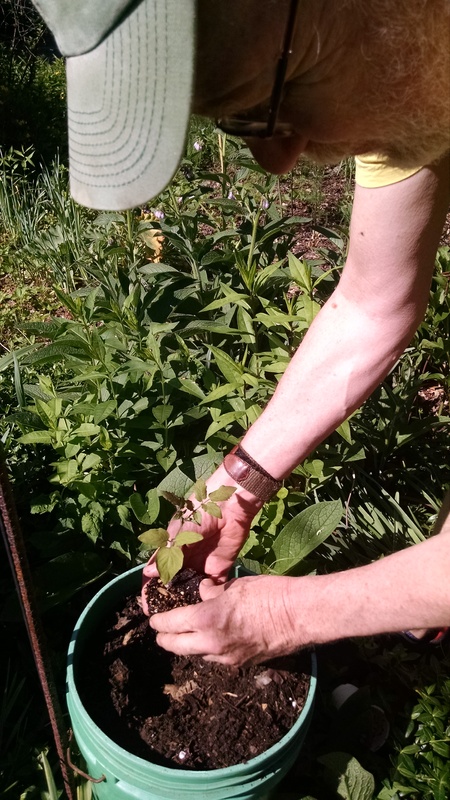 We have four established elderberry bushes in our yard, and at a recent NOFA workshop I learned about ways to propagate my own new bushes. 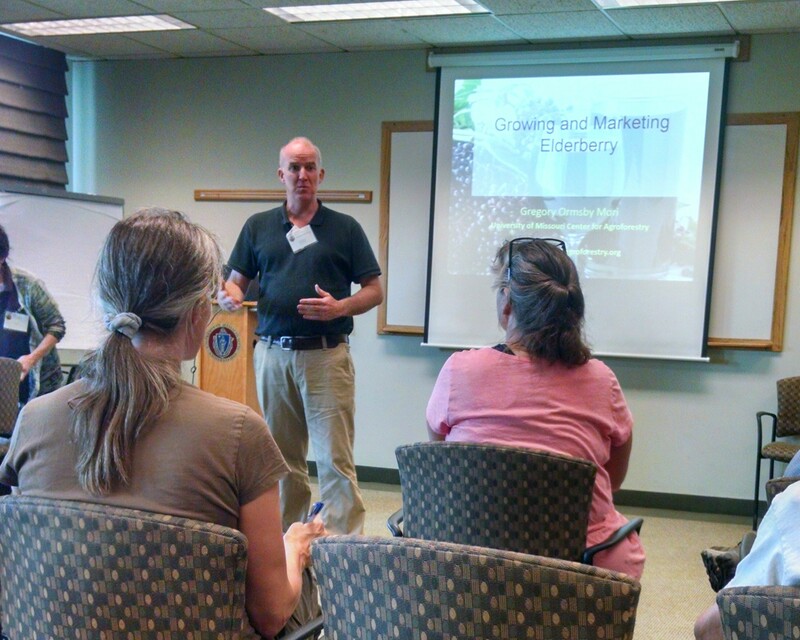 The presenter, Gregory Ormsby Mori, said that there are several ways to multiply the number of bushes. The easiest is called “dormant hardwood cuttings” gathered while you are pruning your bushes (between fall and early spring, before bud break). As you cut off some of the previous season’s new but brown woody growth, collect pieces of pencil thickness. Cutting the base at an angle and the top flat, make sure you have 2-4 leaf nodes on each piece. Then you just stick the pointed end in the ground with some nodes below and some above the surface of the soil. Most will form roots and sprout leaves without any further work on your part besides a bit of watering and weeding. Who knew!? One can also root softwood cuttings early in the growing season (May to June), after dipping the bottom of the cuttings in a root hormone powder or solution. Previously, when I cut off the heads (cymes) heavily loaded with these black, shiny berries, I spent long hours picking off each little berry before processing. Tedious! 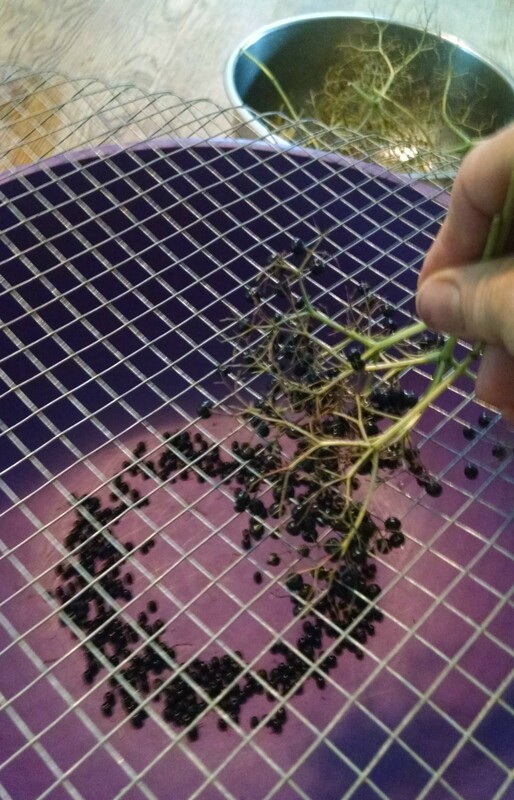 But two quicker ways to do the job are: 1) Freezing the whole cluster of berries and then removing the still frozen berries and 2) using a homemade “destemmer” constructed by cutting a piece of hardware cloth to fit over a container (bowl or bucket) and gently rubbing the clusters on the hardware cloth (shown in photo). The berries just fall into the container. The small number of fine stems remaining are easily picked out. Place 30 fresh flower heads in large non-reactive bowl. Zest, then slice a few organic citrus fruits (I used 1 lemon and 2 oranges). Remove seeds and add to bowl. Boil 8 cups of water and then dissolve about 4 cups of sugar into the hot water. Pour mixture over flowers and fruit in the bowl. Cover with a tea towel. Let the mixture sit in the basement for three days, stirring thoroughly once a day . Strain through a tea towel or jelly cloth into a large pan and bring the syrup to a boil. Dissolve about 3 Tablespoons of citric acid into the syrup (optional), Pour the syrup into sterilized glass jars. This will last up to a year in the refrigerator. Use as a drink. Add 1 T. or more of syrup to a glass of seltzer water. And as usual, I am also drying berries to brew into a healthful syrup during the cold and flu season. Although currently most of the elderberry consumed in the U.S. is imported from Europe, we have an opportunity to grow elderberry locally for juice and wine, jams and jellies, food color and, of course, for our home medicine chest. My tomato plants are wonderful but vulnerable. Some are as tall as me, and loaded with swelling fruit, but they are at risk of the Black Death. Its more common name is Late Blight. This week last year, the leaves of my tomato plants started showing black lesions. I tried to fight the fungus by spraying a copper solution, clipping off diseased branches, and in many cases pulling up entire plants. We picked a lot of green tomatoes last year. This year, I used red plastic mulch on two tomato beds and can report that it really works. The plants growing over it are significantly larger and more fruitful than the others. And the tomatoes planted around buckets of compost with holes in the bottom, plus the red mulch, are doing the best of all (as shown in photo). The tomatoes have loved the abundant rain of the past eight weeks, and haven’t minded the cooler-than-normal temperatures as much as the peppers and eggplants. 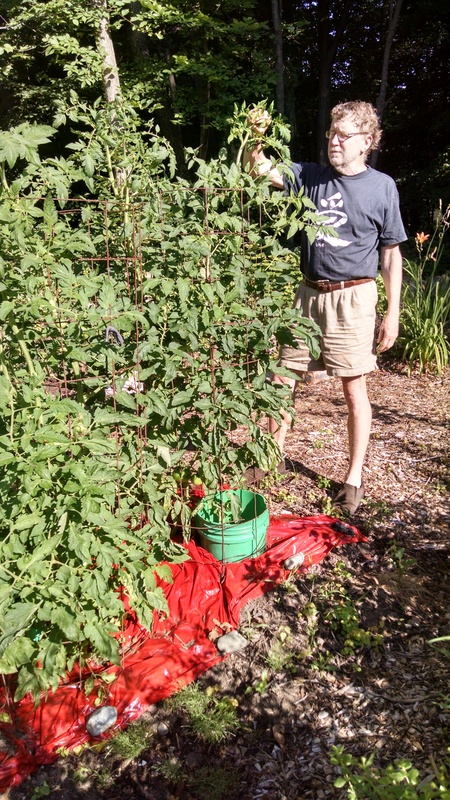 I have six Big Boy tomato plants that I bought at a nursery and four Cosmonaut Volkovs that I grew from seed (the Volkovs adapt well to my cylindrical cages because they don’t branch out). Most of these have the red plastic mulch. I have four Honeydrop cherry tomato plants, two of which are doing well growing in buckets of compost. The three Bobcats are poking along, but my one paste-type plant is thriving. As a hedge against the Black Death, I’m growing one plant each of two resistant varieties called Mountain Merit and Defiant. (I love the names they give to tomatoes.) I’m also growing one mystery tomato plant (it looks like a Brandywine). That makes 21 plants in all. Because of Late Blight, we preserved only 25 quarts of tomatoes in glass jars last year, and ran out several weeks ago. Because tomatoes have high acid levels, they may leach out more of the hazardous chemicals put in can liners than other foods do. I’m growing plum tomatoes to try to avoid using cans of paste. To fight the blight, I started spraying with a copper product called Soap Shield on July 6 and have sprayed twice more since then. It’s approved for organic gardens, but I still cover my skin and put a handkerchief over my mouth and nose while spraying. I try to spray before humid or rainy periods, because those are the conditions the blight favors. Does it work? I don’t know. Yesterday a tomato grower told me she’s spraying hydrogen peroxide to avoid the blight. So I’m just crossing my fingers and hoping for an abundant harvest! For new readers of this blog, here’s an index of more than 120 past posts, divided into 12 categories, including simple living, frugality, fruits & vegetables, living without and climate change. We grow cherries in our front yard, but they don’t come from a tree. 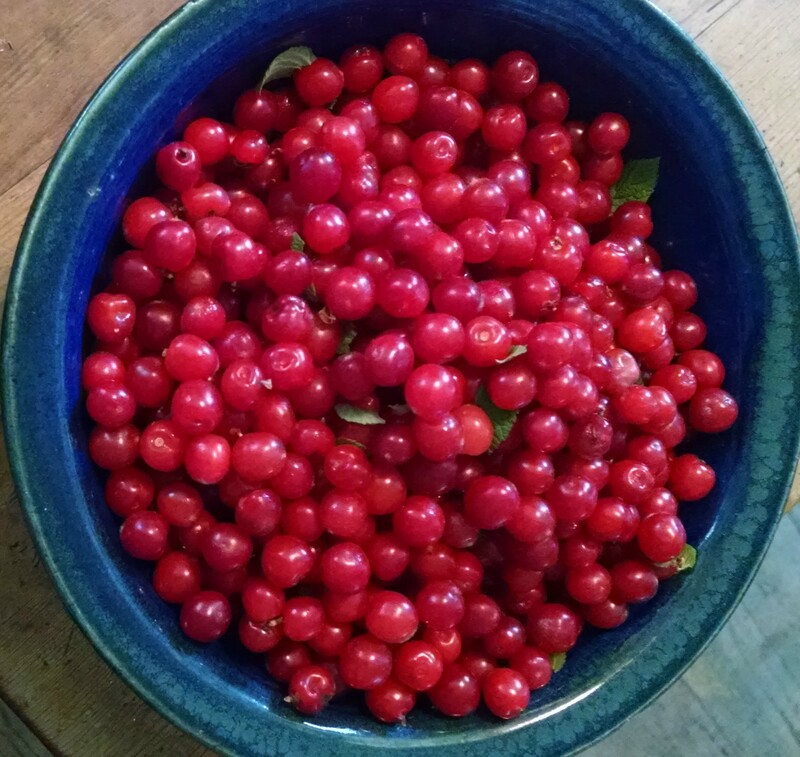 We have three Nanking cherry bushes that have produced lots of fruit that is ripening this week. 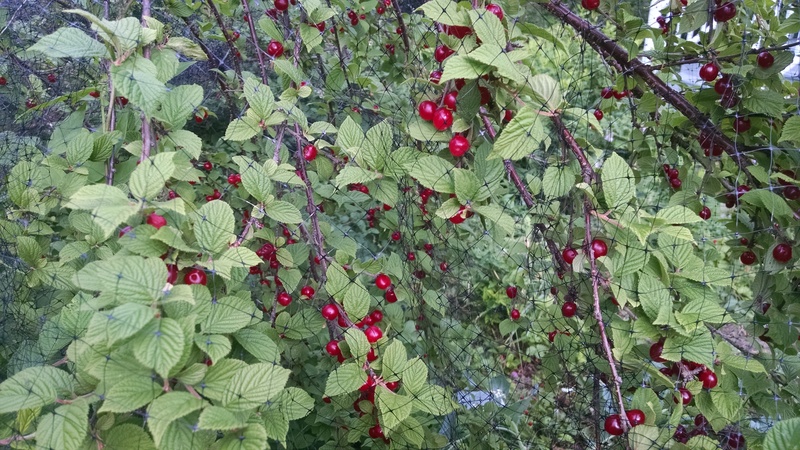 These bushes bear small, sweet cherries that are very tasty when turned into jam. The shrubs are also covered with beautiful white blooms in early spring. After the petals fall off, and before the cherries turn red, we cover the branches with netting to keep them from being devoured by birds. This year, the cherries are particularly abundant, and it’s been a race with the birds to see who gets them first. Luckily, there are so many cherries that there are plenty to share. Nanking cherry plants (prunus tomentosa) originate in Asia. The bushes don’t take up a lot of space and are drought-resistant, hardy and easy to grow. They don’t require any pesticides. They’re short at 6 to 10 feet, so the cherries can be picked easily. At that height they don’t cast too much shade on other plants. And they don’t block the sun from reaching the thermal air panels on the south wall of our house that supply solar heat in the winter. 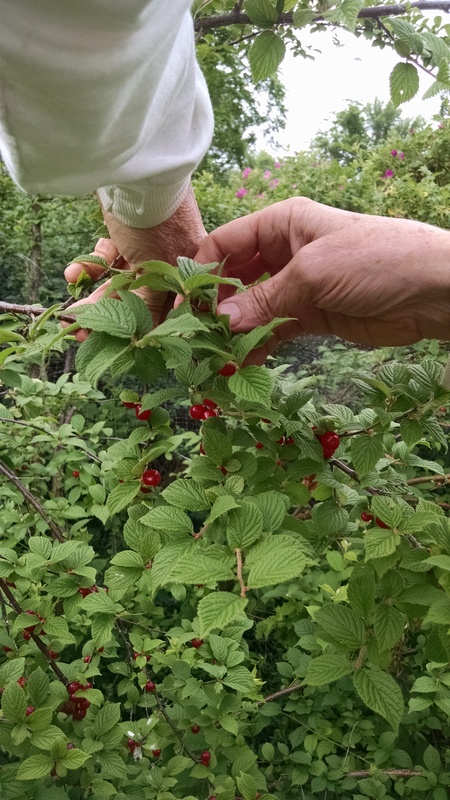 Picking the cherries is time-consuming, but can be fun if turned into a social activity. On Sunday Betsy and I donned our picking containers, made out of cut-off plastic milk jugs. With our hands free, we picked three pounds of cherries in 45 minutes. On Monday we refined our technique and picked one and three-quarter pounds in 15 minutes. Next we laid the berries out on a tray and picked off whatever stems and leaves came along for the ride. We put the cherries in a pan with water (3 cups to 3 pounds) and brought them to a boil, then cooked them for 10 minutes. 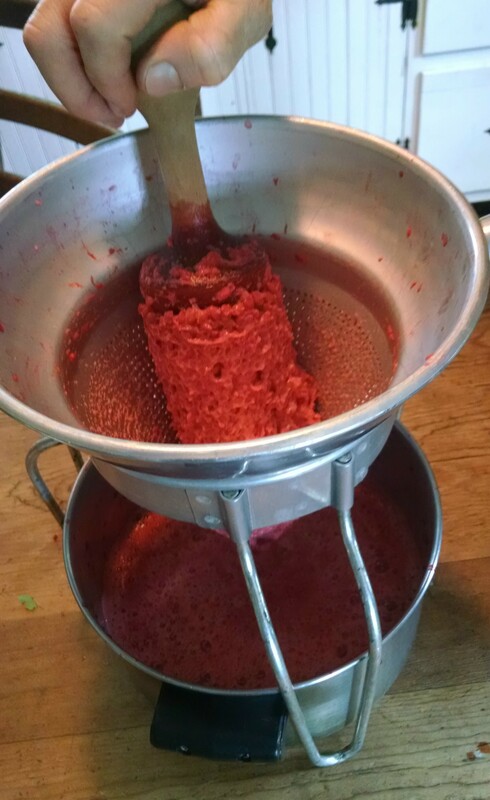 We then put them through an old-fashioned food mill to separate the juice and pulp from the skin and pits. After cooling, this juice and pulp went into the freezer to await the making of jam. 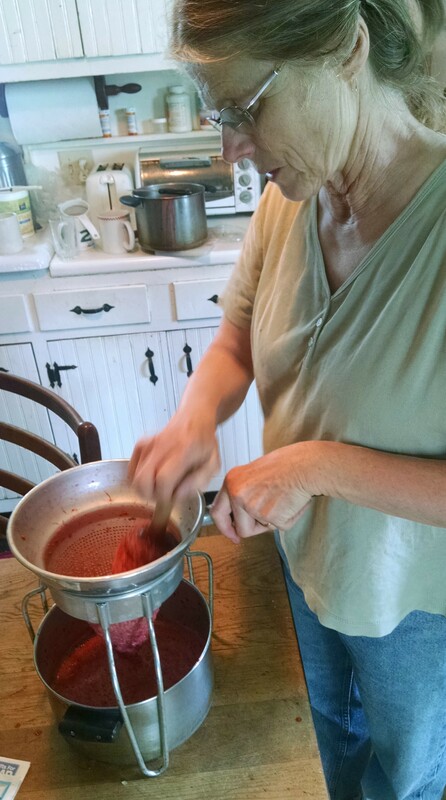 On a cool fall day Betsy will combine the thawed cherry pulp with crabapple juice, which is tart and full of pectin. She gathers crabapples from a public shade tree and cooks and strains them in a way similar to the cherries. Mixing four cups of the juices with three cups of sugar in a large, stainless steel cookpot, she will bring this to a boil. After that she’ll cook it at a low boil until it reaches the jellying point, or when it sheets off a spoon (the spoon on the right in the illustration). She’ll fill clean glass jars with the hot liquid jam, top with lids and rings, and process in a hot-water bath for 15 minutes. Homemade cherry-crabapple jam is delicious and makes an excellent gift. The fruits and berries of summer are the foundation for happy breakfasts all year round. Betsy also makes raspberry jam from our own raspberries, and picks autumn olive berries, from an invasive plant found all around our area, for tart, high-lycopene jam. 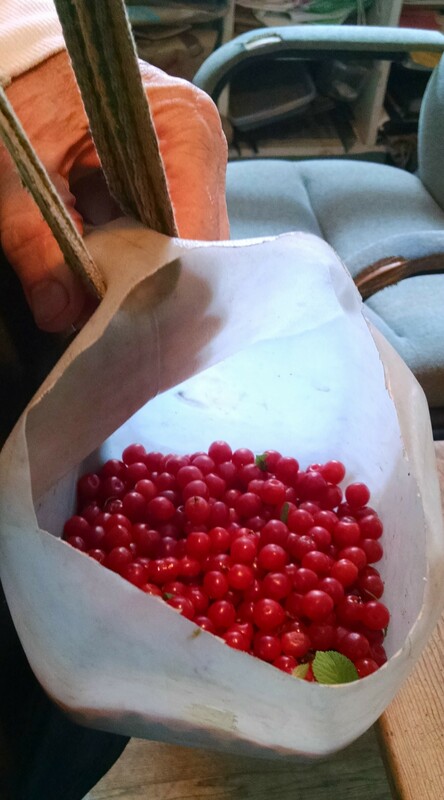 Our gooseberry bushes, now in their third year of bearing, are very abundant this year. Like Aesop’s ants, we will be working hard all season, picking and processing these fruits for the long winter ahead. Come on, fellow ants, it’s jamming time! I like to tinker with tomatoes and putter with potatoes. This year, I have several what-if projects going with these two old standbys. One tomato experiment is supposed to mimic drip irrigation while providing continuous nutrition. I took two 5-gallon buckets and put holes in the bottoms and sides by driving a nail through the plastic with a hammer. Then I filled them half-full with compost, buried them partway in the ground and planted tomatoes around them. The idea is that you fill the buckets with water every few days, and it seeps through the compost and out the holes, enriching the soil and keeping it moist. But I made bigger holes than I planned, and probably made too many. The water is draining out of the buckets in hours, not days. Next year I’ll make the holes with a drill and make fewer of them. Epsom salt is often used to bathe tired feet and relieve constipation. I want to see if it helps tomatoes. I put a tablespoon of it at the bottom of each hole before adding dirt and compost and then planting tomato seedlings. Epsom salt is magnesium sulfate, and I’ve read that tomatoes often don’t get enough magnesium. For a test, I have four Bobcat tomatoes, half of which got the magnesium boost and half of which didn’t. I may also mix a tablespoon in a gallon of water and spray the foliage. This is my second summer using red plastic mulch. This technique is supposed to increase tomato yield; certain colors of plastic work best for certain crops, and tomatoes prefer red. I put the red plastic on two tomato beds and one of eggplants. One problem is that rain doesn’t easily reach the plant’s roots, so it’s important to keep the tomatoes wateredj. Another is that the plastic disintegrates after a few years and it may be a pain to pluck pieces of it out of the garden. We grew more Honeydrop cherry tomato seedlings than we have room for, and even after giving many away, we still had some left. So I took a bucket with holes in the bottom, filled it up with dirt and compost, and planted a mobile tomato, as shown in photo. I’ve never done container tomatoes before; we’ll see how this works! All of this experimentation will be for naught if the dreaded late blight hits as hard as in the past two years. I started spraying a copper solution on my tomatoes in early July last year, and still got the blight. Some farms got wiped out. My local garden store was selling some resistant varieties this year, but I’m betting that this year weather conditions won’t favor the blight. We received over 100 seed potatoes this year as a gift and have had to get creative with them. 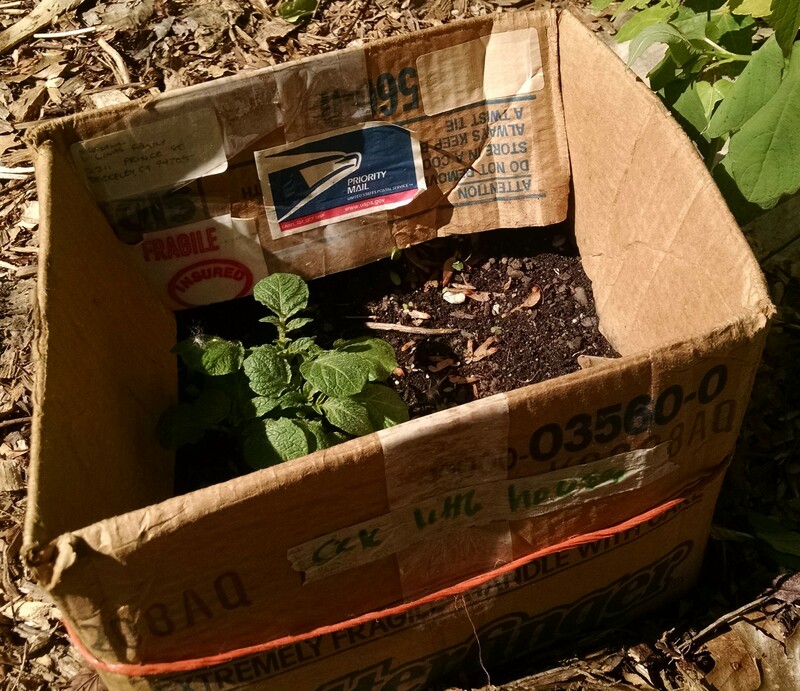 In addition to our potato high-rises, we have taken four cardboard boxes and filled them partway up with dirt and compost, then planted two seed potatoes per box. We took a metal tub, drilled holes in the bottom, and planted potatoes there. We created a 5×2-foot potato crib beside our fenced garden and planted about 25 potatoes near the beans, a plant that likes to be near potatoes. We are hoping to get deluged with potatoes this fall, but first we have to watch out for the nasty Colorado potato beetle. In a few weeks, we’ll start looking for its orange eggs on the underside of the leaves. Gardening is an ongoing learning experience!